The post Kalank teaser: Alia Bhatt loves Varun Dhawan, marries Aditya Roy Kapur in this gorgeous… appeared first on Bollywood latest news. Filmmaker-choreographer Remo D’Souza, recently choreographed two of biggest trend-setting songs, Madhuri Dixit Nene starrer ‘Tabah Ho Gaye’ and Kriti Sanon starrer Aira Gaira from multi starrer..
Kalank stars Alia Bhatt, Varun Dhawan, Aditya Roy Kapur and Sonakshi Sinha in the lead roles. 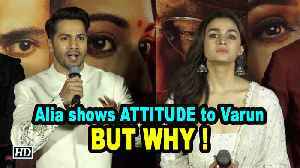 Kalank featuring Alia Bhatt, Varun Dhawan, Aditya Roy Kapur, Sonakshi Sinha, Madhuri Dixit and Sanjay Dutt is not doing well at the box office.